Are you eating breakfast? Could it be better? This is the last of the breakfast club! I have given you two more options. For more relaxed days and in-between days. Get on the breakfast train! July 28, 2012 | Categories: Diet, Goal Setting, Health Tips, Inspiration, Motivation, Nutrition, Personal Fitness, Personal Health | Tags: Breakfast, breakfast club, cereal, morning, weight loss | Comments Off on Breakfast Club, Final Meeting! Breakfast: No Time? No Worries! Every day is different – Right? Just like our Seattle Summer Weather we never know what the day will bring. You may hit the snooze button too many times and sit bolt upright in a panic. You may wake up early and have the day off. Or you may just have a typical day where you have just enough time – but no extra. Since Time is the common thread here to a good breakfast. I have made three options for you. This is my week last week and what I had to work with. Biggest take away here – is always have a prepped option, for your no-fail plan! Day 1 : Busy Day – no time! I rarely wake up late. I cherish my sleep and usually get to bed by 9:30 – but this morning, I surfed the web a little too long, and hit snooze a few times – OOPs! No time! What to do for breakfast? – Before I take the dog around the block, I pop a waffle in the toaster, smear some almond butter on it and grab a banana. 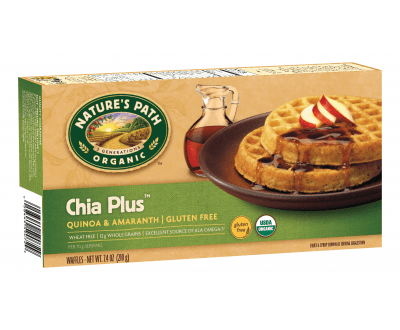 The best waffle choice I have found is nature’s path – I love the Chia Plus and Buckwheat Wildberry. Either one gives you fiber, whole grains, low in sugar, mod in carbs. great for a slender waist and high energy. Almond Butter gives you more protein and keep you full longer. Look for kinds with nothing else added. Ingredient label should say: Almonds – THAT’S IT! 1 tbsp is plenty. Remember you will burn this off by lunch. Let’s say – I was in such a rush I forgot my waffle. 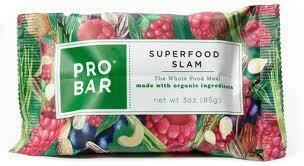 That’s when I grab a Pro-Bar , superfood slam. I love this one! That way I’ve already started my day with some greens, fiber, protein and healthy carbs – to rev up my metabolism and keep me going till lunch. I always buy 2 a week – keeping one in my bag and one in my glovebox. Fail Proof! Stay tuned for other breakfast on not so harried days! July 23, 2012 | Categories: Health Tips | Tags: Breakfast, breakfast club, In a hurry breakfast, on the go, Pro-Bar, toaster waffles | Comments Off on Breakfast: No Time? No Worries! Last week I posted an entry on beautiful people (surfer’s) and what they eat. One big component to a great body is BREAKFAST! Allright – # 5 is not guaranteed, but if you are thinking clearer and have more energy and better mood at work – you definitly should be in the running for a raise and people should be flocking to you ! Check yourself before you wreck yourself! Smart and Gorgeous people eat breakfast! Read on for easy ways to join the club and get results! Last week, when I went to the USDA in Washington, D.C,. to attend the unveiling of the new food icon—MyPlate—to accompany the 2010 Dietary Guidelines, I also met Michelle Obama (!). Full disclosure: I was lucky to be in the right place at the right time and it was brief, but long enough for me to ask the First Lady what she ate for breakfast that morning. So, what did she have for her a.m. meal? Scrambled eggs, turkey sausage and fresh grapefruit. Delicious, healthy and nearly in line with MyPlate. She was missing her grains and dairy. She fell short on vegetables, too, though if she doubled up on her fruit servings that would have counted as a sufficient substitution for a vegetable serving. This made me—and some other editors in the EatingWell office—curious… What do other nutrition and health experts eat—and how do their breakfasts compare to MyPlate?